Dual Maps is a map creation tool that allows anybody to make an embeddable map that includes a Google Map, a Google Maps Street View and a Virtual Earth Bird's Eye view of the same location. You can choose between the various options of either map service, which means you can have the Google satellite view alongside Virtual Earth's Bird's Eye view or the satellite/aerial View in both maps etc..
Dual Maps now comes with a couple of new features. It is possible to add a Google search bar to a Dual Map, which means users can search for local businesses from the map. It is also possible to choose from a number of marker styles in the Street View map. You can choose between the traditional pegman, a panda, a car or Gachapeg. 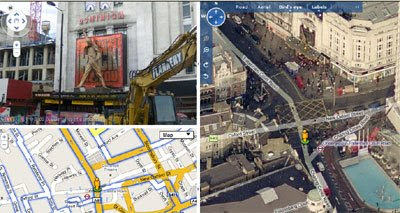 This map places Bing Maps' Bird's Eye View side by side with Google Maps' new Aerial View. At the moment Google's Aerial View imagery in Google Maps Labs is limited to only a few cities in the USA. However as Google expands their imagery this map mashup will expand to reflect the new aerial view available. This map is pretty great, but the inability to resize windows and display pictures/wikipedia links makes it less than optimal. Do you know if it´s possible to modify it in such a way? You can resize the map width & height (the first options in the map style) and you can resize the iframe width & height but I don't think you can resize the individual map windows. I actually don't think Panoramio / Wikipedia links would be such a good idea here because they would only show on the Google Map window anyway - so the space would be quite restricted. Hey Keir, thanks for the tips. I´ll take a look about the Feed Maps thingy, not sure that I´ll be able to deal with it, since I have no idea how this things work, and it doesn´t seem exactly for "noobs" like myself. In any case, I found globeglider, which does everything I was asking for and then some, since it allows me to open both streetview and Google Earth, both in sync. Still not perfect, but the closest to that I´ve been able to find so far. If you know something better than that, please let me know.